The LED luminaire is ideal for high profile architectural, hospitality and commercial environments with tall ceilings. 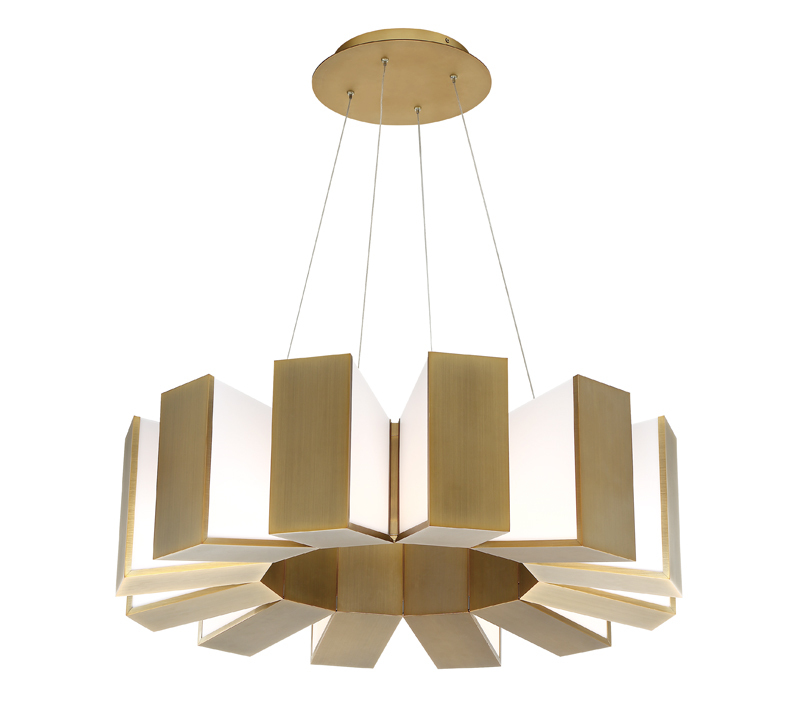 Modern Forms this week announced the debut of its new Chronos chandelier. The large sculptural chandelier is suspended and powered by adjustable ultra-thin aircraft cables for a clean look. The LED luminaire is ideal for high profile architectural, hospitality and commercial environments with tall ceilings and large spaces. Hand finished in Aged Brass to complement the latest interior decor, the chandelier is crafted of aluminum hardware with white sanded acrylic diffusers. The luminaire operates with a universal 120V-277V driver and dims beautifully with an ELV, TRIAC or 0-10V Dimmer. The 75-Watt model, with a 50-inch width and a cable length up to 130 inches, delivers up to 2696 lumens using high output LEDs. A 34-inch, 48-Watt version, with a cable length up to 99 inches, is also available. Both chandeliers deliver 3000K illumination with a 90CRI and a 50,000 hour rated life.